Since discovering the Instant Pot, cooking has become less of a struggle for me…it’s just easier. 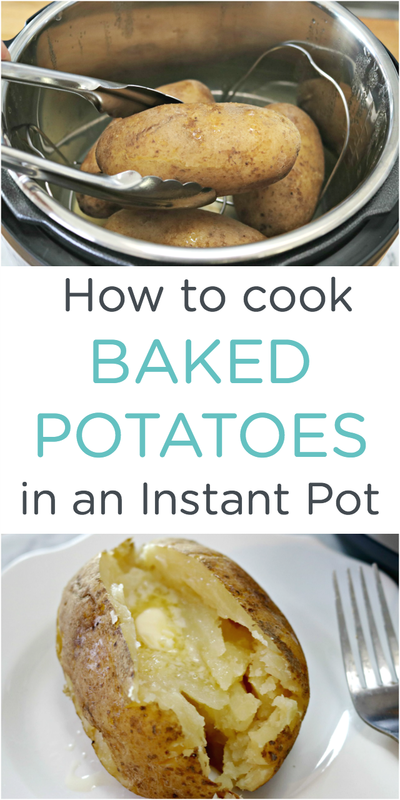 I thought I would share my tips on How to Cook Easy Instant Pot Baked Potatoes with you because, honestly…they are the best baked potatoes I have ever had! No muss, no fuss! This post contains affiliate links, which means that if you buy a product using one of those links, I will receive a small commission.I have recently become obsessed with my Instant Pot. It’s such a relief to be able to cook meals quickly without sacrificing taste, and my IP has saved dinners for my family a lot lately. You know how it is…it’s nearly time to start dinner, and you’ve forgotten to lay something out to thaw. That used to mean that we either had to go out for dinner or that everyone was eating either a sandwich or a bowl of cereal. My Instant Pot makes it so much easier to remedy the forgotten thaw out. It cooks meats from frozen if need be and is great for sides as well. Last week, I decided to try to cook our baked potatoes in the IP, and they came out absolutely perfect! It was so nice to just throw them in and walk away. No turning needed, and no hard center with more baking time needed…they cut open like butter! If you are interested in purchasing an Instant Pot of your own, you can find the one that I have HERE! Check out the short video I put together below showing just how easy it is too! 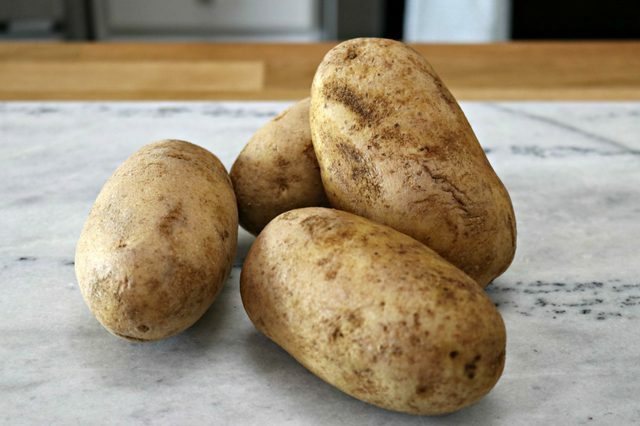 Step 1 – Start by cleaning up to 6 baking potatoes. Step 2 – Poke several holes in each potato. Step 3 – Place the steaming rack in the Instant Pot. If you don’t own a steaming rack, you can purchase one HERE. 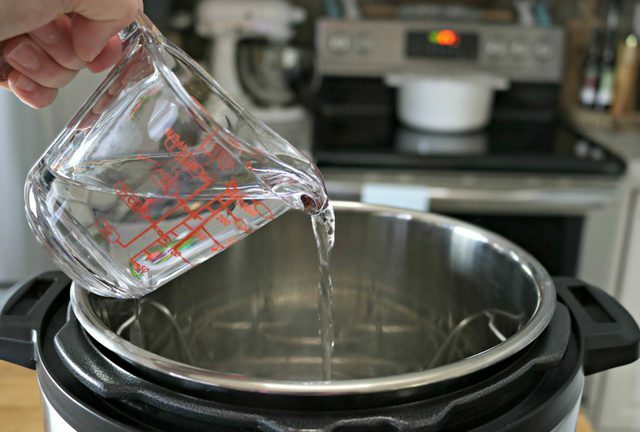 Step 4 – Pour 1 cup of water into the Instant Pot. 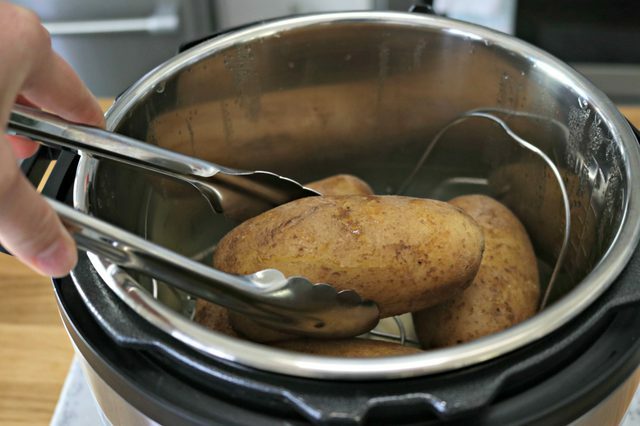 Step 5 – Place the potatoes in the Instant Pot. 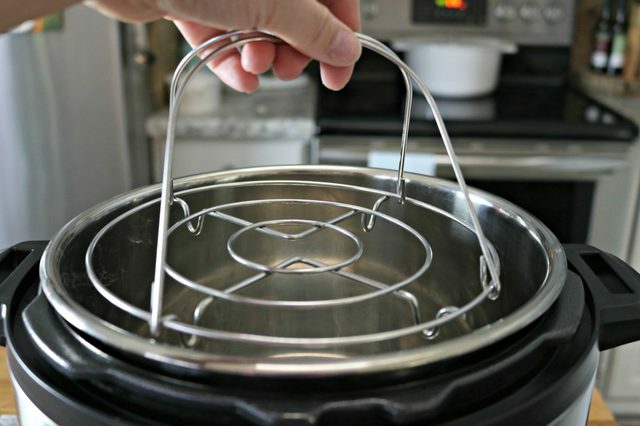 Step 6 – Place the lid on the Instant Pot and lock it in place. Be sure the pressure valve is sealed. 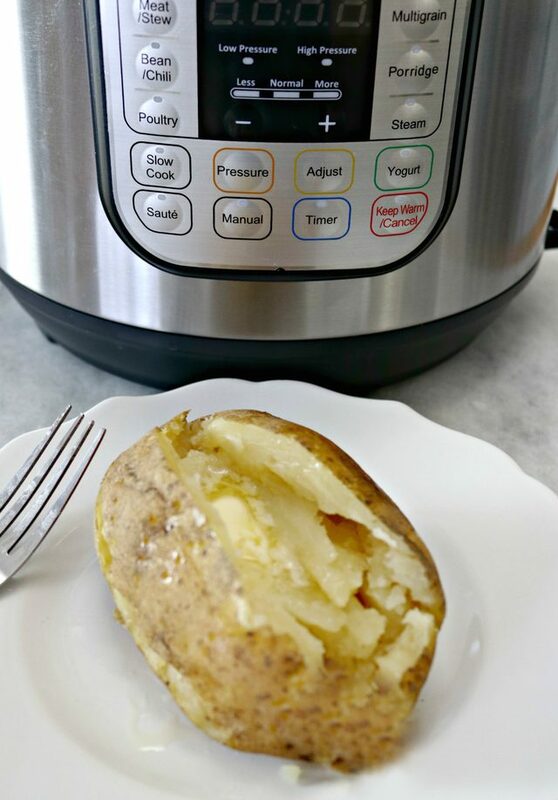 Step 7 – Press the Manual button and set the timer to 20 minutes for medium sized potatoes and 30 minutes for large potatoes. The pressure will start to build inside, and once it has, the timer will begin to countdown. Step 8 – Set the pressure valve to quick release and stand back so the steam doesn’t hit your face. It is VERY HOT. 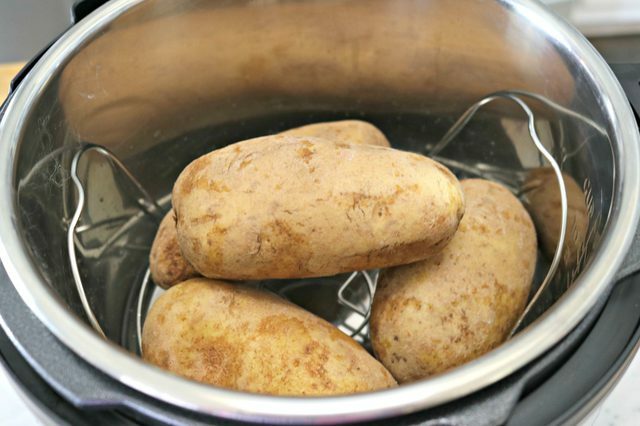 Step 9 – Remove the potatoes and serve immediately. The baked potatoes come out perfect every single time, and have quickly become one of our family favorites! 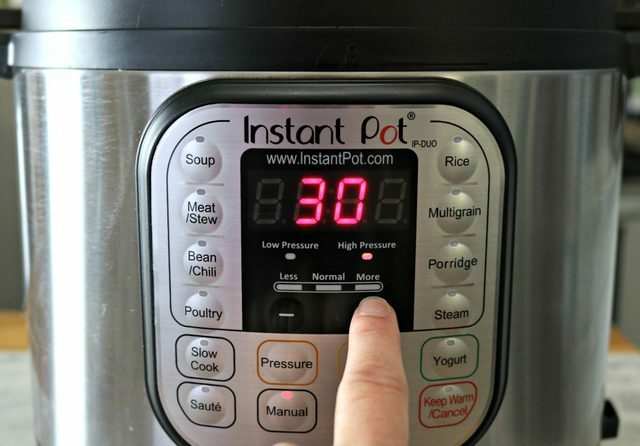 I’ve also shared a couple of other easy Instant Pot recipes and hacks…check them out below! Never mess up hard boiled eggs again. 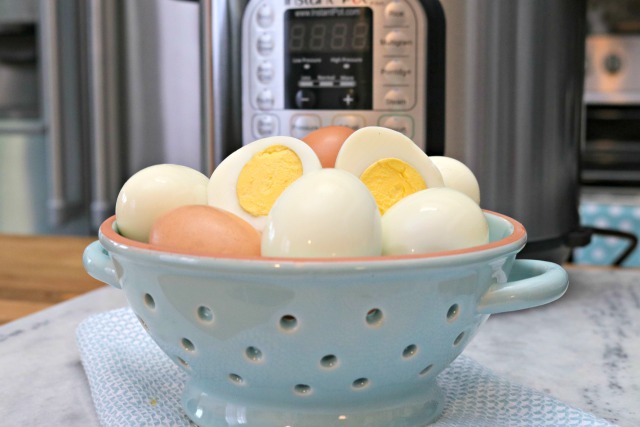 This post on How to Cook Hard Boiled Eggs in an Instant Pot makes perfectly cooked eggs every time, and they are so easy to peel too! 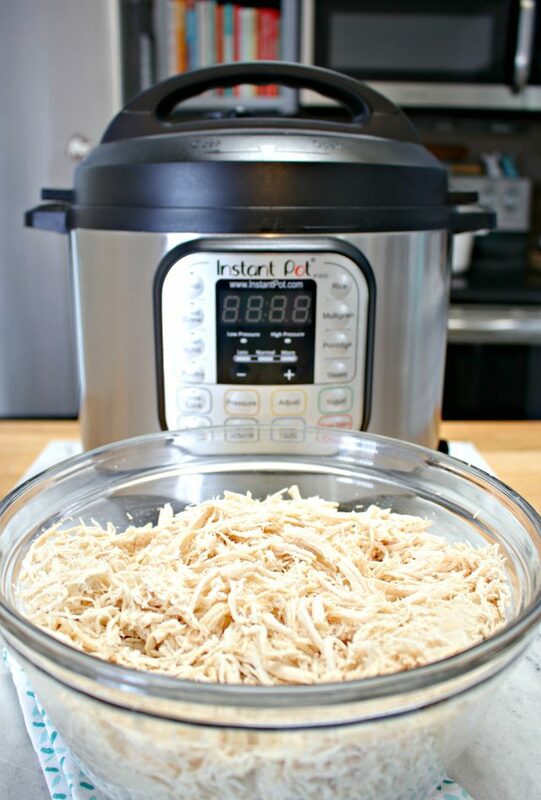 You can cook chicken from FROZEN in an Instant Pot in a short amount of time too! See How to Cook Chicken Breasts from Frozen in 30 minutes so you can shred it for all kinds of things like tacos, soups, nachos, salads and to have as is! 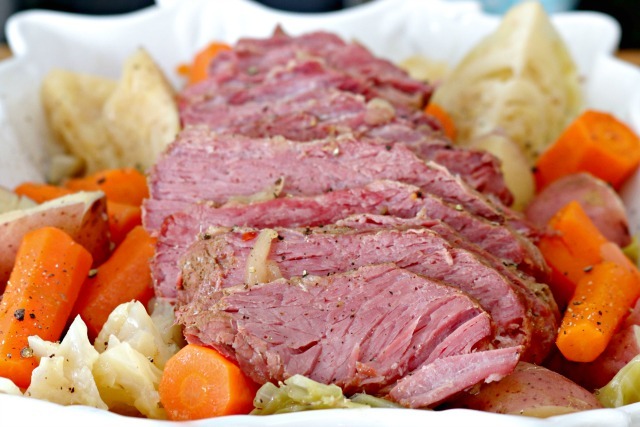 Corned beef and cabbage is one of my favorite meals, and it’s not just for St. Patrick’s Day! Find out How to Cook Corned Beef and Cabbage in an Instant Pot HERE! Looking for even more Instant Pot Recipes? 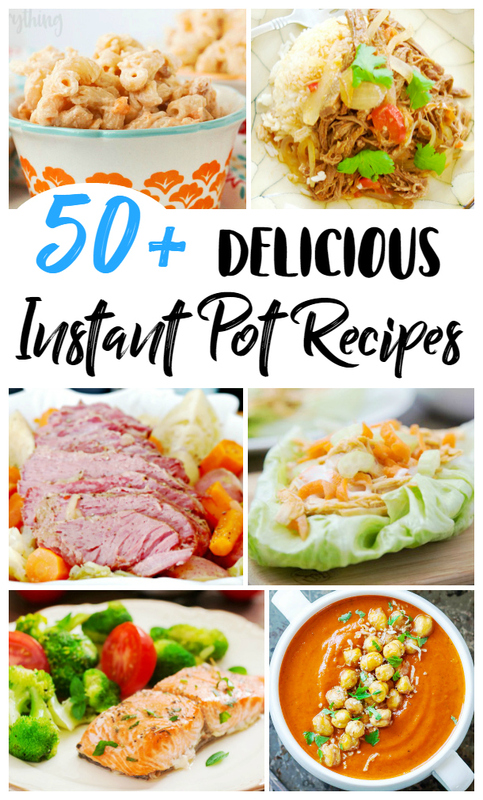 Check out 50+ Delicious Instant Pot Recipes all in one place HERE! You are not going to believe all of the foods you can make in an IP! Soon I’ll be sharing some amazing ideas for easy Instant Pot Breakfasts as well. I just have a question regarding your baked potatoes. You said set the vent to Steam. Do you mean leave the pressure valve open? Then pressure won’t build up. Your next instruction talked about the pressure building so I’m a little confused. I’m new at this IP business. Thanks. Hi, Tait! I know it can be confusing, and I try the best I can to explain it plainly. 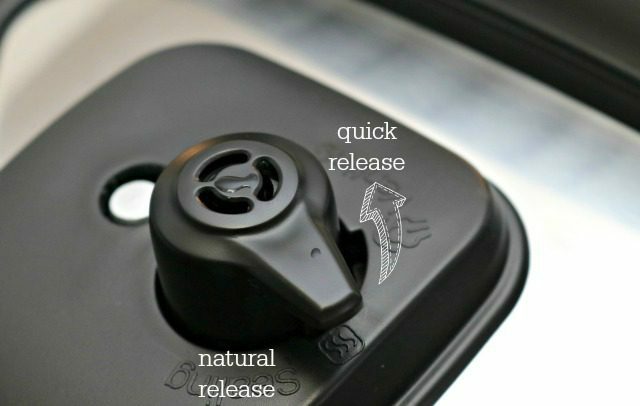 You want the vent closed during cooking for sure, and you only want to vent it at the end. Hope this helps! I AM SO GLAD YOU ASKED THAT BECAUSE MY POT ONLY HAS A SEALING AND VENTING AND I WASN’T FOR SURE WHAT TO DO EITHER. NEW TO ALL OF THIS! She meant to say set it to “Sealing,” not “steam.” ???? I haven’t tried it yet but sounds intriguing. Mostly because I was always under the impression that baked and cooked potatoes are different and taste very different. 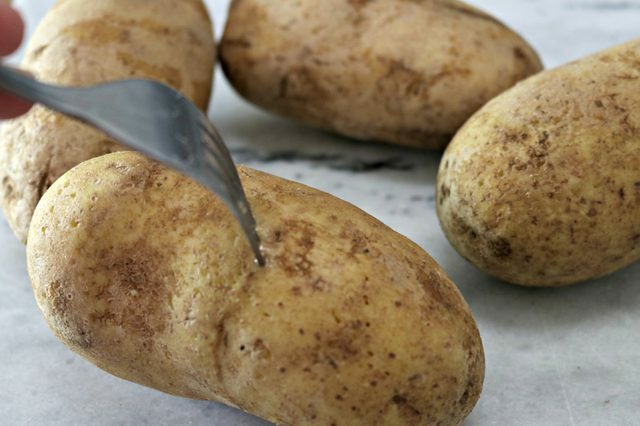 That baked potatoes have a very distinct texture, while cooked ones are kind of gummy. I understand that you are excited about the speed and the consistency but would you care to comment on the texture? I have tried baked potatoes in the Instant Pot and mine definitely were not gummy. They are light and fluffy. I won’t make them any other way in the future. Just try one and see what you think. It’s very easy to copy (highlight) the recipe and then paste it into a new email. I use Gmail, don’t know about others, but Gmail copies perfectly, with formatting and all. I use Gmail for my filing system now, as you can find anything with sut a one word search, OR, you could put all your recipes into a folder. I set up account in Pinterest, then created folders for each heading (main dishes, breakfast, desserts etc). Even separated IP & air fryer from oven/stove recipes. That’s amazing…I’ve done the same thing! It makes searching for recipes that you have saved so much easier! I had never heard of Copy Me…I’ll check it out! Thanks so much! CAN YOU DO AS LITTLE AS 2-3 POTATOES IN TE 6QT IP? Trying to decide if I want to get one for the two of us. I like the outside of my potato with kosher salt. Can I still coat with butter and salt, wrap in tin foil and then cook in the pot? Do I need to increase cooking time due to foil wrap? I’m not sure about the foil, but it’s worth a try! Hi, Sylvia! Are you signed up for my emails? There is a place to subscribe on my home page, mom4real.com if you haven’t signed up. Any time I add a new recipe, it goes out via email. Also, here is the link to air fryer recipes I’ve shared so far…there are tons more to come!